It’s pouring, it’s dreary, and it’s windy. Boy, is it windy. The tops of the trees are doing that wild whirly thing that makes me wonder why they aren’t snapping, but then I remember that they’re doing exactly what’s in their nature. Trees are flexible. I’m flexible, too. It may seem like I am all socks, all the time, but no. I have other skills. I can knit a giant diagonal washcloth, full it, and call it Annabelle’s blanket. I cast on 4 stitches with two strands of Elann’s Peruvian Collection Sierra Aran on size 17 needles and I’m doing the good old k1, YO increase. I have way too many balls of this color (Deep Forest), enough for more than a sweater, so I think I can spare a few or four for a cozy kitty blanket. Annie loves her spot on the couch, and she seems to like a little thing to sleep on. I’m going to knit until I’ve used two balls, then start decreasing for the second half. When I’m done, into the washer it goes. These three colors have joined the other beloved sock yarn in my stash. First is Fleece Artist Sea Wool in Peridot, which I ordered from Simply Socks Yarn Company. The colors — so quiet in this skein — remind me of the shallow water at the edge of the bay. The yarn is 70% Merino and 30% Seacell. It’s new to me, and I love the way it feels. 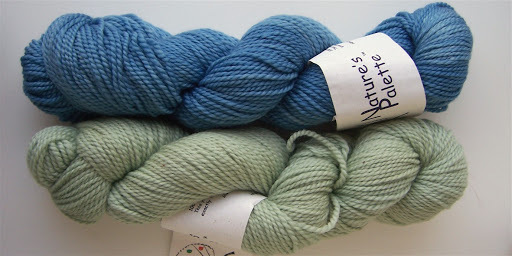 Next are two Nature’s Palette colors from Naturesong Yarns — Dark Indigo and Seafoam. I am drawn to anything Indigo, so I want some Indigo socks. Seafoam just makes me smile. I swear, I had something else to say. I’ve been sitting here at the keyboard for what seems like forever, but it’s not coming back to me. 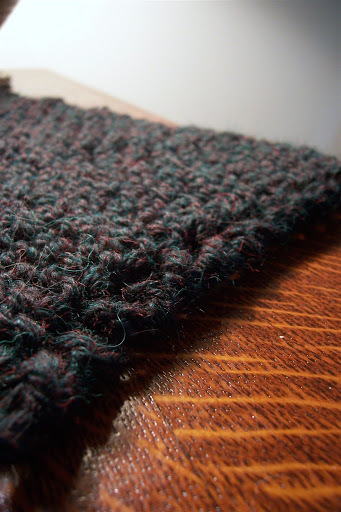 I think I’ll just go back to the comfort of the garter stitch blankie. LOL – ah, Annabelle the recluse… At least she will soon have a lovely blanket, no?I hope your hatches are battened for that storm! Congratulations, you’re on get stitchy!Thanks so much for submitting your blog. Fortunately, in our part of Vermont, the Winter Storm Warning got downgraded overnight. Yes, it snowed. But you can still see the tips of the grass, so it didn’t snow that much.This spring is insane. Jake, too, hates having his picture taken. It’s interesting, isn’t it?Trees are flexible, but not completely flexible. Yesterday’s wind snapped a bunch of them on the Hill.Glad you’re safe and sound, indoors, knitting.